Ample space paired with best ergonomics and impressive design - the Nitro Concepts C80 gaming chairs unite all of these benefits into one high-quality swivel chair, which doesn't just easily qualify as a comfy office chair, but also brings all the requirements to the table to be called a veritable gamers chair. The C80 Pure series presents even further improved breathability thanks to its partially perforated seating surface cover, which grants a pleasant experience, especially during summer. In addition, this version comes with a black polyurethane (PU) faux leather cover, whose gorgeous design has been inspired by race car seats. All Nitro Concepts chair series from the Carbon Class feature a PVC back side covering with an eponymous carbon look. The whole package is being completed by subtle black seams and a Nitro Concepts logo that adorns the headrest. As an added bonus, a little metal plate with logo lettering is included with every unit to allow you to proudly proclaim your ownership of a Nitro Concepts gaming chair. More links for "C80 Pure Series Gaming Chair - Black"
Good value chair very comfy, had some quality issues with my first one but replaced no issues at all with OCUK. I would say good value for money. Setup was very easy until trying to attach the bottom of chair to the back.. Im no DIY god so probably why. Easier if 2 of you do that bit to hold in place. Chair itself yes very comfy, my only regret is that the arms do not move up or down and i should have gone for the other models of chairs. 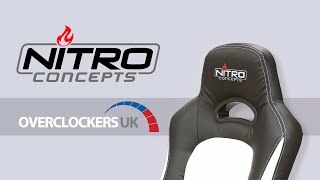 "Overall I’m pleased with the Nitro Concepts C80 Pure as they’ve produced a chair that looks good and more importantly is very comfortable straight out of the box." "Overall, we are impressed with this product and the value for money factor of the C80 Pure series gaming chair is apparent without the loss of quality."